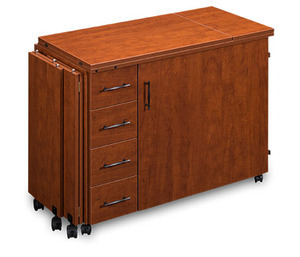 Over 18 square feet of surface area makes the 1520 one of our most popular models. Shown here in our new Sunset Cherry color, you can see how beautiful—and functional—the cabinet is. 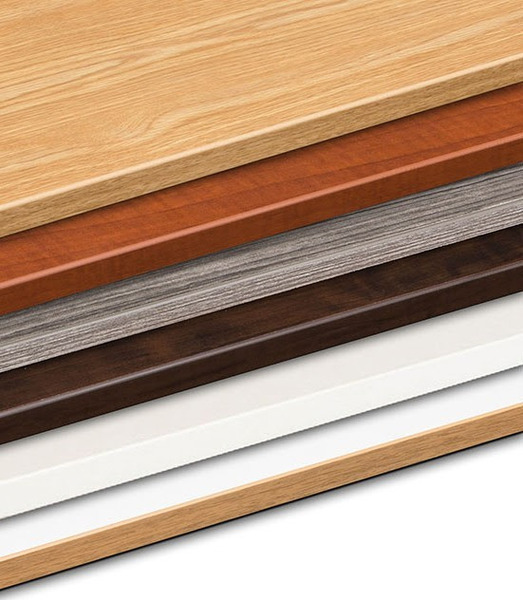 Not only is the color new but so is the style, we have redesigned the support gate‐leg to provide sturdier support for even the heaviest quilts and bulkiest fabrics and now it matches the wood cabinet color. sturdier support for even the heaviest quilts and bulkiest fabrics and now it matches the wood cabinet color. 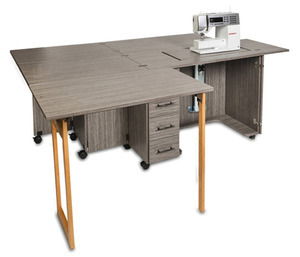 Add the optional Quilter’s Extension (#1570) to the front (not pictured) and now you have well over 20 square feet in which you can sew, quilt, and create! 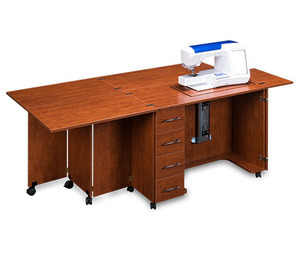 This is perfect to quilt large quilts, sew drapes, home décor, and other large projects. 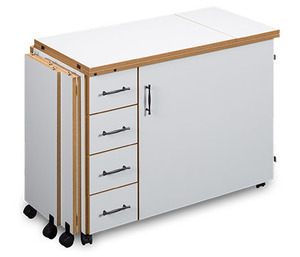 Adjust the size of the cabinet by choosing to fold down the back or side extensions. Click here to view Sylvia Design warranty information. Shown open, all extensions up, machine support in the highest position and able to support a large embroidery machine and its attached embroidery unit. Shown with the optional #1570 Quilter's Extension and machine insert.